The yellowfin tuna is one of five varieties of tuna that has been harvested for centuries. All tuna belong to the Sombridae family of mackerels. 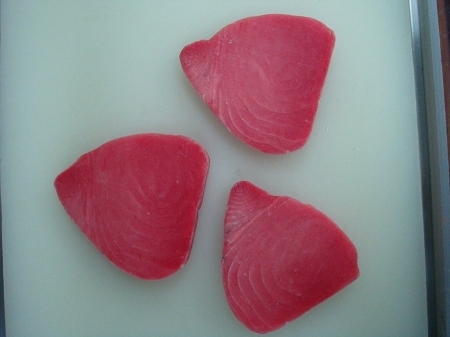 Yellowfin tuna are the second most important commercial variety of tuna. They usually congregate in schools and swim with or near porpoises. Some nations have limited the harvest of yellowfin's that involve the excessive bycatch of porpoises. Like all tuna the yellowfin is a fast swimmer that can migrate thousands of miles in several weeks. 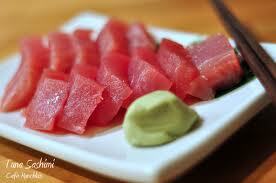 Harvested tuna usually grow to between 9 and 45 kg (20 to 100 lbs), but can grow to 180 kg (400 lbs).